I remember years ago there was one basin design available, they were rounded in the front and came with a pedestal, these basins are still popular today, but there is so much more on offer to finish your new bathroom to perfection. 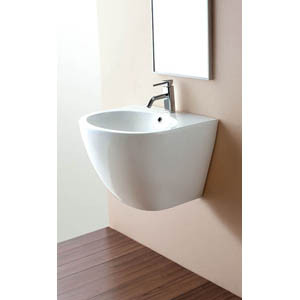 The wall hung vanity basins are the best option for the compact bathrooms such as en-suites and cloakrooms. They hang on the wall, advantage one and they leave ample floor space, the second advantage. In fact these wall hung vanity basins look spectacular enabling you to use the space below them as storage or just leave open to give a sense of spaciousness. I think a small cloakroom is probably one of the hardest of all the bathroom designs. What do you need in a small cloakroom? A toilet and a basin and if you can fit in a little storage to store toilet rolls and hand towels. The wall hung vanity basins are basically floating basins that are modern, stylish and offer that minimalist design that you desperately need in a really compact space. Some cloakrooms are barely the size of a cupboard and once you get your toilet in, there isn’t much room for anything else, which is why these vanity wall hung basins are the perfect solution. You can place them on the side wall close to the toilet, just have your towel ring alongside and your cloakroom is complete. Often an en-suite bathroom isn’t much bigger than a cloakroom, cloakrooms are a toilet and basin that are used when guests come to visit and the en-suite is your private bathroom that leads off your main bedroom. With the smaller spaces you need to take advantage of your wall space and leave as much floor space as possible. Cramping too much into an en-suite bathroom will immediately make the bathroom feel cluttered and claustrophobic, which is why I always suggest the wall hung vanity basins. The best thing about these basins is how easy they are to clean, you can mop the floor under them with ease and don’t have to spend your time scrubbing the pedestal, completed with a stylish and modern bottle trap and your bathroom is ready for use. Any small bathroom will benefit from additional floor space, by hanging your basin on the wall you immediately make your bathroom feel bigger than it really is.